Archery is one good way to spend some time outdoors whether for competition or just for fun. Modern crossbows nowadays are fast, accurate, and plenty powerful enough to cleanly take the largest big-game animals. To get the most out of your crossbow, you need to understand the basics of how to set one up for hunting and how to shoot it. Though it's nice to own a crossbow, there are also some regulations when owning one. Crossbows are like firearms and can be dangerous, and some states in the US have strict regulations regarding the use of crossbows. So it is better to check first with the local authorities or anyone you know who owns one. If ever you are planning to buy a crossbow, here are some tips you might want to look into before spending your hard earned cash. First, consider buying the best that you can afford because there is a big difference between a cheap one and a high-end model. You can buy crossbow packages that include everything you need to get out shooting and hunting. Second is to use enough draw weight. With a few exceptions, any crossbow in that range should be adequate to kill a whitetail deer at moderate ranges and most of the better hunting crossbows are in the 150 to 175 pounds range. Third is to use quality arrows. Cheap arrows manufactured to sloppy tolerances will fly like a knuckleball and most likely not accurate. That’s why you should use only the very best arrows designed specifically for crossbow shooting. 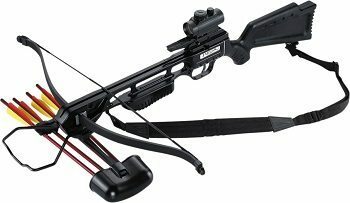 Now, if you are looking for a quality crossbow, here are the top best today. The Barnett Jackal Crossbow offers an innovative design, the Barnett Jackal crossbow features a sleek, military-style stock with a divided foregrip for comfortable hand placement. It features an AVI foot stirrup, AVI bolt retainer, ADF MIM trigger mechanism, high-definition camouflage, quad limbs, High-energy wheels, 3.5-pound trigger pull, synthetic cable system and a Picatinny/Weaver rail. It can shoot at 315 feet per second with 150-pound draw weight. 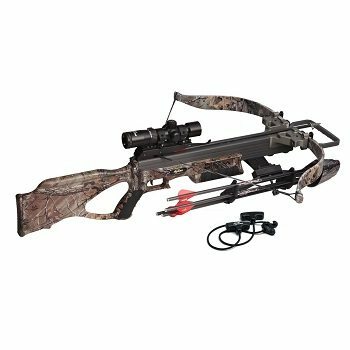 It is a complete crossbow package, includes quick-detach quiver, bolts, and premium red dot sight. A sleek, military-style stock with high energy wheels, synthetic string, and cable system. Product dimensions are 33 x 13 x 7 inches and weigh 12 pounds. 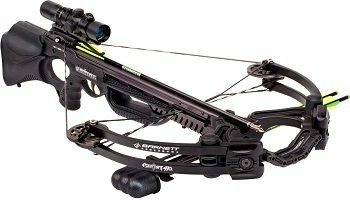 Another great product from Barnett that made its way on this list, the Barnett Ghost 410 CRT Crossbow. 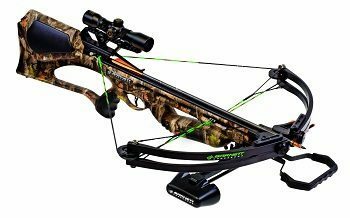 It features a 20-inch axle to axle, 410 FPS, 185 pound draw weight, Quiver, 3 Arrows, Rope Cocking Device, Talon Sling and 3x32 Scope. It may be lighter and faster than its predecessor, the Ghost 400, but the 410 has maintained some of its most impressive features. The Barnett's unique patent-protected, ultra-light, super-strong Carbonlite Riser boasts an incredible 5-to-1 safety factor that provides the perfect balance of weight and speed. Product dimensions are 34.2 x 18 inches and weigh 7.9 pounds. The Excalibur Matrix 355 Crossbow gives all the advantages of a Compact Recurve Technology, a compact platform, unmatched durability, lighter-weight, enhanced accuracy, improved balance, reduced recoil/noise and easier cocking and are willing to sacrifice just a little speed of 355 fps is still extremely fast and a few features, then the Matrix 355 is for you. It features Matrix 355 3500 Realtree camo w/tact-zone, 240 pounds draw weight and a 12.2-inch power stroke. The Excalibur Matrix 355 is well-balanced and lightweight. Small for a recurve bow and so portability is good. Product dimensions are 35 x 6 x 10 inches and weigh 10 pounds. The Jaguar CR-013 Series Crossbow is a hunting crossbow designed with accuracy, safety, and durability in mind. 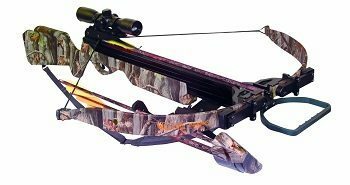 It features a 175-pound draw; fires crossbow arrows at speeds of 245 FPS, slotted cast-magnesium barrel for accurate bolt flight tracking, Weaver-style rail includes a single dot 30mm red dot scope with 7-level brightness adjustment. 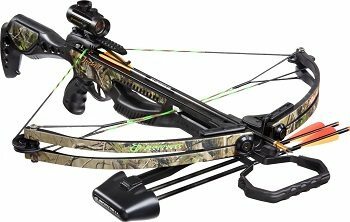 It also includes a six-bolt detachable quiver, four 16-inch aluminum crossbow bolts with 150-gr points, safety glasses, and a shoulder sling. Offering modern accuracy, safety, and durability, this crossbow is designed to have you hunting with confidence in no time. Product dimensions are 30 x 14 x 6 inches and weigh 7 pounds. The TenPoint Invader G3 crossbow offers a novel design platform focused on speed, weight reduction, and maneuverability. It features the new tactical-black 12.3-inch WL12 limbs powered by a new Energy Wheel equipped with DynaFLIGHT 97 string and cables with tunable yokes. New pass-through fore-grip backed up with new, longer, glass reinforced nylon safety wings fitted on the stock above the grip. In addition to these new safety features, the stock is also fitted with TenPoint's DFI and highly regarded 3.5-pound T2 trigger. Product dimensions are 37.8 x 12 x 7 inches and weigh 6.6 pounds. The Inferno Wildfire II is known to be the most powerful Recurve Crossbows on the market, boasting a robust 225-pound draw with speeds up to 345 FPS. It features a premium 4x32 Multi Reticle Scope (Red and Green), Next G1 Soft Touch Microprint Camo, Noise Reduction System. Lightweight, Evenly Balanced Soft Touch Stock with CNC Machined Aluminum Rail and Riser with Special Allow Limbs. The package comes fully equipped with 4-20 inch Carbon Bolts, Quick Detach Quiver, Padded Sling, Stringer Cable and Rope Cocker. Product dimensions are 39.5 x 36.2 x 8 inches and weigh 7.3 pounds. The Barnett Quad 400 is redesigned to maintain its reputation as shooter's favorite with new features. It includes three arrow quiver, three arrows 22-Inch, 4x32 multi-reticle scope. Features a camouflage finish, GAM composite stock, quad limb design, four-pound trigger pull, CNC Cam, Machined scope mount and synthetic cable system. A high-density gas assist composite stock is the first of its kind in the industry, is lighter and more comfortable than its predecessor, and includes an integrated cocking device attachment. This Barnett crossbow includes a limited five-year warranty against defects in materials and workmanship. Product dimensions are 33 x 13 x 7 inches and weigh 14 pounds.